This week I will be busy volunteering for my church's vacation bible school, so I've asked a few friends to share some of their favorite health and beauty posts. I'm so glad she shared this post because we accidentally grabbed an eggplant when we bought plants this year. Would you believe that I have never had eggplant? This will have to change after harvest! Hi! My name is Lois and you can usually find me blogging over at Walking on Sunshine Recipes. I'm so happy to be guest blogging for Cari! Today I'd like to share with you a recipe for one of my favorite summer vegetables...Eggplant. 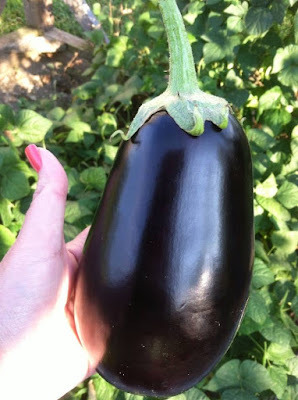 We recently started growing eggplant in our garden. Here's one from last summer. Isn't it beautiful? Ever since I was a little girl, one of my favorite ways to eat eggplant is breaded and fried. Only frying anything isn't healthy anymore and I needed to come up with a different way to enjoy eggplant again. I now make it "unfried" in the oven and it comes out amazing! It's the only way I make eggplant now and I know you and your family will enjoy it "unfried" as well. Peel and slice the eggplant. In a bowl, or plastic container, crack and beat the eggs. Place the one cup of breadcrumbs in a separate bowl or plastic container. Dip the eggplant slices into the eggs and then into the breadcrumbs; place on a parchment lined baking sheet. Just before baking, spray each eggplant slice with non-stick cooking spray. Bake in a HOT 435 degree oven for 10 minutes. Then remove tray from the oven and flip each eggplant slice and spray again with non-stick cooking spray. Return the trays to the oven and cook for another 5 minutes, or until done. Remove from cooking tray and let cool slightly on a cooling rack before eating. Note: You can also sprinkle any seasonings, salt, pepper, Italian seasoning, that you enjoy on top of the eggplant before placing them in the oven. I have also tried brushing the eggplant slices with olive oil but I find it makes the slices greasy and not crispy. AND...you may need to use more eggs or breadcrumbs depending on the size of your eggplant. You can see how many slices my medium-sized eggplant gave me in the photo below. For this amount, I used 3 eggs and 1 cup of breadcrumbs. If you run out, just add more! Or turn into Eggplant Parmigiana, if there's any leftover! Just layer the eggplant slices with tomato sauce, mozzarella cheese and bake in a 375 degree oven for 30 minutes. I would love if you would join me on Walking on Sunshine on Facebook! We have a lot of fun all day long, but I really enjoy our dinnertime conversations!